Smoke rings offer wonderful lessons in fluid dynamics. Use them to initiate discussions on fluid flow, air pressure, and Bernoulli's principle. This lesson contains instructions for how to build your own smoke ring machine out of an empty soda bottle, and outlines the physics principles behind the formation and motion of smoke rings. Instructions are also included for the jumbo version built out of a 40-gallon trash can. It's also possible to make underwater rings using a dinner plate and a body of clear water. Lecture slides attached. Plastic bottle smoke ring generator by Llegaexperimentos. The video above shows a smoke ring generator made out of a plastic bottle and a rubber balloon. The video below shows a second version made out of a 40-gallon plastic trash can and a shower curtain, which also requires a fog machine.1 The small machine can blow out a candle at a distance of several feet. The large machine can blow a paper cup off a teacher's head at 20 feet. An acetylene-powered version of this device has been used to generate 200 mph rings that can blow over a brick house at distance of about 50 yards (see https://www.youtube.com/watch?v=IyAyd4WnvhU). Homemade smoke ring cannons demonstrated by Steve Spangler and Ellen DeGeneres. Remove the bottom of a 12 oz. to 20 oz. plastic soda bottle. To make the membrane, cut the mouth off of a rubber balloon. Stretch it over the bottom of the plastic bottle. If you don't have a balloon of the right size, you can substitute by cutting a piece from a plastic freezer bag for food and holding it in place with a few sturdy rubber bands. Now you are ready to fill the can with smoke. The most convenient method is to use a couple of sticks of incense. Light them and stick the burning end into mouth of the the bottle until the bottle fills with smoke. If you don't have incense to burn, take a 6" square of paper towel and roll it up into a tight roll. Light the end. Once the paper towel is burning well, blow out the flame and stick the still smoldering end into the bottle. Keep it there for about 30 seconds. WARNING: Make sure you have a safe place at hand to put the burning incense or paper towel. A paper towel can smolder for many minutes after it has been blown out. Once the can is filled with smoke, push very gently on the flexible membrane to send a puff of smoke out through the mouth of the bottle. As the puff of smoke emerges, it should quickly form a well-defined smoke ring, which travels forward for a couple of feet. You can also operate the device as an air cannon without the smoke, but it's a lot better when you can see the ring. Bigger is better. Take a 30 to 40 gallon plastic trash can and cut a 6" to 8" diameter hole in the bottom with a box cutter or sharp pocket knife. Cover the open top of the trash can with a piece of plastic shower curtain cut to fit. Hold it in place with bungee cords around the lip of the can. Fill the can with fog from a fog machine and tap on the shower curtain to send large fog rings out of the cannon. Home-use fog machines can be found from a number of novelty stores, or big package stores during the weeks leading up to Halloween. See the equipment link at the top of this page for some online sources. The "juice" for a fog machine can be purchased with the machine, or you can make your own out of glycerine and water. For details on how to make your own fog juice, check out the wonderfully thorough description at http://www.bigclive.com/smoke.htm. Fig. 1: As the air stream emerges from the device, room air drags the outside of the stream, slowing it down. The center of the air stream continues to move forward, causing the air stream to curl to the outside, in the direction of the yellow arrows. Fig. 2: Air flow in the toroidal vortex, as viewed from the front. Fig. 3: Movement of air molecules in a cross section of the ring. The air molecules towards the interior move faster than molecules towards the exterior, in accordance with the conservation of angular momentum. Fig. 4: Motion of a smoke particle in the ring. The trajectory results from a combination of the rotational motion around the interior of the ring and the forward motion of the ring as a whole. The movement of the air stream through the still air initiates rotating air currents, which then produce a low pressure region that pulls the currents into a tightly shaped ring. As air flows out through the opening, the surrounding room air drags on the outside of the stream, slowing it down, while the center of the stream continues to move forward. As a result, the stream of air curls to the outside, forming a toroidal (donut-shaped) ring of air, as in figure 1. The air continues to rotate forwards in the center of the ring and backwards on the outside of the ring (figure 2) as the whole ring moves forward. The faster moving air on the interior of the ring produces a low pressure region in accordance with Bernoulli's principle. (See our lesson on Bernoulli's Principle and the Venturi Tube for more details on Bernoulli's principle.) This low pressure region helps to pull in the rotating air to form a tight, well-defined ring. Indeed, as the ring emerges from the cannon, you may observe that it first forms a large nebulous shape, but it quickly tightens into a sharply-defined ring as the air rotation and the Bernoulli effect kick in. The actual trajectory of a single air molecule in the ring is perhaps more complicated than one might imagine (figure 4). It follows a looping trajectory, a little bit like a blanket stitch in sewing, resulting from a combination of the rotational motion around the interior of the ring and the forward motion of the ring as a whole. Humans are not the only creatures that can make donuts. Dolphins and whales are experts in blowing air rings under water, as shown in the amazing video below. Under water air rings from dolphins and whales, and smoke rings from volcanoes and other explosions. The air rings blown by dolphins and whales operate on the same principles as the fog rings from our air cannons. They demonstrate a remarkable stability due to the pressure forces holding them together, and can be steered and even flipped by their creators (see the video above at time 1:18). Moreover, it is possible to blow one ring through the center of a previous ring as demonstrated by a diver in the video at time 3:45. The motion of air in the toroidal vortexes facilitates this trick. The inside edge of the previous ring rotates forward while the outside edge of the subsequent ring rotates backward; the two rotational motions coordinate to drag the second ring through the center of the first ring. 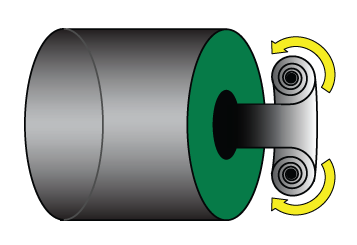 Once the second ring has been pulled to the front, the air rotation now encourages the first ring to be pulled back to the front through the second ring. In principle, the rings might exchange places many times. You can make your own underwater rings even without getting wet. You will just need a dinner plate, a body of clear water (bathtub or swimming pool), and some food coloring. Physics Girl explains how in the video below. Physics Girl demonstrates how to make a semicircle ring vortex in a swimming pool. If you don't see any smoke coming out of the bottle, there are two possible explanations. 1) You haven't put enough smoke into the bottle. Hold the smoldering paper towel upright and invert the bottle over the paper towel. Look through the bottle to make sure the paper towel is still producing smoke. Keep it there until the bottle is clearly filled and smoke is leaking out the hole. 2) The smoke rings may be difficult to see in a bright room. The best viewing is in a well-lit area with a dark background. Aim towards a dark wall as you watch from behind. If smoke comes out but does not form well-defined rings, experiment with how hard you tap the membrane. Usually a very gentle tap, just moving the membrane slowly with one finger, produces the best smoke rings. Does your classroom have smoke detectors that prevent you from doing this experiment? One alternative is to replace the smoke with a couple of ounces of warm water and an ounce of dry ice. Some large retail chains like Safeway, Kroger, City Market and Costco sell dry ice at some of their stores. Check the equipment link above for dry ice for suggestions. Call your local store to confirm. A number of commercial suppliers can be found at the Dry Ice Directory. Or search http://www.yellowpages.com/ for "dry ice" in your area. WARNING: Dry ice freezes at a temperature of -79 oC (-109 oF), cold enough to serious damage to your skin. Always handle dry ice with gloves. This lesson follows nicely after Vortex in a Bottle, which can be used to demonstrate the physics of vortexes and get students thinking about the relevant physical principles (conservation of angular momentum, pressure, Bernoulli's principle). Alternatively, the attention of middle school students is readily captured by examining the vortex water flow in a toilet, which can be used to initiate the same conversation on vortex behaviors. Be careful not to get dragged into a discusson of the Coriolis Force, which is sometimes invoked to explain which direction the water rotates as it drains, but is too small a force to have a measurable effect on water in a toilet. (See our lesson on Tabletop Flaming Hurricane for more on the Coriolis Force). For students unfamiliar with the concept of angular momentum, it may be helpful to first look at our lesson on Desk Chair Angular Momentum. Demonstrate the smoke ring first and give students a chance to figure out why and how the donut-shaped ring forms. Follow with figure 1. Once students have determined that the smoke particles are rotating around the ring, ask them what force is causing that rotation. (According to Newton's 2nd law, an object orbiting in a circle requires a central force causing it to turn.) This question should guide them to a discussion of air pressure - there must be a difference in air pressure (low in the interior of the ring, high at the exterior of the ring) in order to hold the smoke particles in their circular orbits. The source of that dynamic pressure difference is the Bernoulli effect, where the molecules at the interior of the ring move faster than molecules at the exterior of the ring. For an engaging puzzle, see if your students can figure out the path of a smoke particle in the ring (figure 4) on their own. While we don't advise allowing students to blow cigarette smoke rings in class, they can experiment with blowing fog rings on a cold dry winter day. As long as you can see your breath, you can blow fog rings. Take your students outside to cool them off and let them practice. For geeks who want the detailed mathematical description of vortexes, Rod Cole has posted some excellent notes on fluid dynamics at http://maxwell.ucdavis.edu/~cole/phy9b/notes/fluids_ch3.pdf. Undergraduate level physics background assumed. 1. I first saw the trash can version of the smoke machine in a wonderful performance by Steve Spangler on the Ellen DeGeneres show (https://www.youtube.com/watch?v=-VL0M0jmu7k). 2. A vortex in which the particle speed is inversely proportional to the distance from the center (as is the case when the rotation conserves angular momentum) is called an "irrotational vortex". Strictly, this description is only accurate up to a point. At distances very close to the center, where the particle speed would need to become arbitrarily high in order to conserve angular momentum, the description breaks down.